New Jersey or the Garden State is the fourth smallest state in the United States. It is bordered by New York, Pennsylvania, Delaware and the Atlantic Ocean. Home to hundreds of 55+ active adult and retirement communities, New Jersey is a place where many individuals prefer to live. While that may have been surprising back in the early days of resort-style active adult communities, developers now know that many empty nesters and retirees enjoy staying close to their hometowns. Choosing an active adult retirement community in New Jersey close to home allows them to live within easy distance of family and friends, while still enjoying the benefits of an age-restricted, resort-style community. 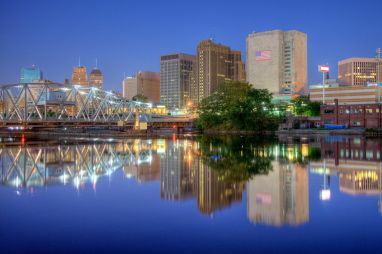 New Jersey is a small, yet populated, northeastern state surrounded by water except along the northern border with New York. It has four main land regions, the Atlantic Coastal Plain, Piedmont, New England Upland and Appalachian Ridge and Valley Region. It has a fairly moderate climate due to it being situated next to the Atlantic Ocean. The climate includes both humid subtropical and humid continental areas. Summers are hot and humid with daytime temperatures in the high 80's to low 90's, especially in the southern half of the state. The more northern regions sit at a higher elevation and tend to be a bit cooler year-round. The winters are cold with daytime temperatures that usually stay below 45 degrees. Snow is common in the winter, though the amount varies from one year to the next. New Jersey plays a big role in the pharmaceutical industry, financial industry, chemical development, telecommunication, food processing, electric equipment, printing and publishing and tourism. The agriculture productions are nursery stock, horses, vegetables, fruits and nuts, seafood and dairy products. New Jersey's active adult residents love that the state is home to teams from several major professional sports leagues, and has many historic and cultural regions. The state played a prominent role in our nation's history and has a reputation as the Crossroads of the American Revolution. Whether it s a Revolutionary War battlefield, lighthouse, state park, or coastal beach, winery or ski resort, there is something for everyone to experience and enjoy. New Jersey's retirement community residents can enjoy its close proximity to major urban centers like New York City and Philadelphia; popular tourist attractions like Atlantic City, the Jersey Shore, and Cape May; and the state's diverse geographical regions, which include mountains, beaches, and wooded areas. With the abundance of active adult retirement communities in New Jersey, it's no wonder that many empty nesters and retirees are choosing to call the Garden State home. Many 55+ active adults love living in New Jersey because the cost of living is lower than other East Coast states. However, the cost of living is higher than the nationwide average. Shopping is huge here because of the low sales tax and they offer sales tax exemptions for a variety of items including clothing and groceries. It also has one of the lowest gas taxes in the nation. Property tax varies from county to county. Over all, however, residents of New Jersey spend more on property taxes than any other state. New Jersey 55+ residents live at ease knowing the state provides great healthcare with top-notch universities, teaching hospitals, research institutions, biotechnology and pharmaceutical companies, and clinical trials. The state has been a strong leader in the world for its research and development industry. The state has brought more drugs to the market than any other state in the nation. There were two programs created by the New Jersey Legislature that guaranteed health coverage for individuals and small employers. Excellent healthcare centers are available throughout the state, as well as across the borders in the metropolitan areas of New York City and Philadelphia.